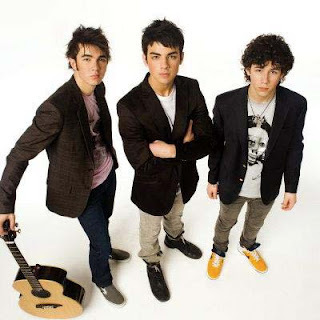 The Jonas Brothers. Pop phenoms. But my question of the day is...so who is the "cute one"? Every band has one. Davy Jones for the Monkees. John Taylor for Duran Duran. Joey for NKOTB. So which one is it in this gang? I mean, they all look the same. And I know that I have the start-up of the English Premiership Footie season on the brain but the fella in the middle looks to be channeling Arsenal's Cesc Fabregas a teensy bit. They've only released one single here which was SOS and I actually really liked it, they were also on a radio show and came across as nice guys. But I don't think any of them are attractive, there just seems to be too much hair involved. Can't see the Cesc-ness either, sorry. Oh yeah, if you cover him up and just reveal the eyes he does look a bit like Cesc. The one in the yellow trainers looks like a mouse. Minus the cuteness.